While the standard "list view" displays the item title and information like sharing state, the thumbnail view displays small previews of your files. 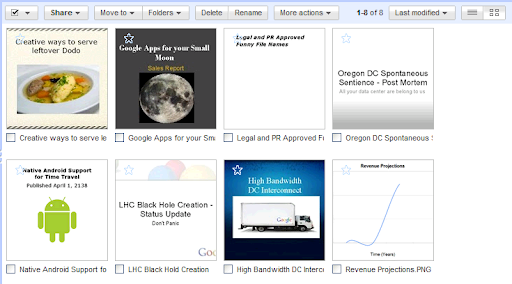 We generate thumbnails for all Google Docs types and most common files (photos, PDFs, etc). You can toggle between the two using new buttons on the top right of the toolbar. When combined with search by relevance, the thumbnail view makes it really easy to find the file you're looking for. Finally, we recently finished rolling out the upload and store any file feature, so everyone should now be able to upload, store, and share any file in Google Docs. We also increased the maximum file size based on your feedback, so you can now uploads files up to 1 GB in size. Earlier today, we added a new view option to your Documents List: thumbnail view.